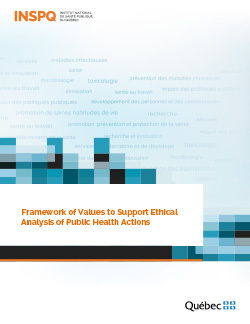 This Framework of Values to Support Ethical Analysis of Public Health Actions was produced precisely to address these questions, some of which were clearly expressed by members of the Table de coordination nationale de santé publique (TCNSP) [A public health coordination body for Québec]. The values proposed here were selected based on not only research reported in the public health ethics literature, but also the experience of the Comité d’éthique de santé publique (CESP) [public health ethics committee], as well as the committee’s discussions with the members of the TCNSP. These values, in our view, appear to be the most appropriate ones for analyzing public health projects. For practical purposes, the values are presented in three categories, thus making them easier understand and to relate to one another. In our view, this categorization reflects the spontaneous reasoning of public health professionals and managers. Indeed, their actions are based on values that are associated with the aims of public health, values that reflect the quality of professional and institutional practice, and other values found in society. These three categories are not watertight. The categorization is simply a convention, as the values that fall under one or another category are all present in our society. For each value, the document proposes a brief definition followed by an illustration of potential challenges to putting the value into practice. The idea is to lay the groundwork for a vocabulary that can be understood the same way by all parties, thus serving as a basis for dialogue. The purpose of the framework, then, is to shed light and thereby support reflection on the values that are most often raised by public health interventions. It also aims to promote clearer communication between public health actors and with the groups concerned by measures that are underpinned by these values. The framework is intended as a complementary tool for ethical review processes such as that of the CESP, which is by no means limited to determining the values at hand or to listing the values presented in the framework. This document should thus be understood as tying in with other works by the CESP and its staff, and especially the proposal of an ethical review process for public health actions.